When you have a lot of ground to cover regularly, it’s smart to upgrade to one of the best commercial weed eaters. What’s the difference between a professional string trimmer and one made for homeowners? The pro weed whackers are built to withstand long hours of use and much more abuse than a homeowner model. Companies that make commercial line trimmers are moving to four-stroke engines because of EPA requirements regarding pollution. This is advantageous for home users because four-stroke engines don’t require you to mix gas and oil. They are also quieter. If you’re new to shopping for weed eaters, there are three things to remember. The first is to consider the weight and balance. If there is a way you can experience how the trimmer feels in your hands before you purchase it, that’s very helpful for ensuring that you’ll be comfortable using it. Third, for your long-term health, consider how much the trimmer vibrates. Strong vibrations over time can damage the nerves in your hands and arms. Opt for one with low vibration and plenty of padding if you’ll be trimming frequently. Now let’s look at reviews of top commercial weed eaters. We hope to help you discover the perfect one for the job you need to do. Husqvarna’s 324L straight shaft string trimmer features a four-stroke 25cc gas engine. That’s 1.07 hp with a top speed of 7000 RPM. Unlike a two-stroke engine, you’ll never have to mix fuel and oil for it. Also important, it’s made to start on the first pull. It has a Smart Start motor plus an air purge for the carburetor. But you’ll still want to wear hearing protection. The 17-inch base helps you cover a lot of ground quickly. And the loop handle allows you to hold it however is most comfortable for you. That’s essential when it weighs 11 ¼ pounds and measures 58.4 inches long. Husqvarna also provides information about the vibration. The front handle was tested to have 9.1 m/s2 and the rear handle 8.2 m/s2. Double-check that against OSHA regulations for your job. The Husqvarna 322L is slightly less powerful than the 324L weed eater above. It has a 23cc X-Torq engine with easy start technology and low emissions. Fans of this model like how easy it is to refill and use Tap ‘N Go trimmer line. Moreover, the controls are so straightforward that anyone with limited experience can pick it up and go. The heavy-duty gearbox ensures that it will stand up to years of use. Tanaka’s commercial-grade trimmer doubles as a brush cutter because it’s compatible with attachments. The 32cc two-stroke engine offers 1.6 hp, enough to slice through the toughest weeds and young saplings. It’s noisy, but it’s a PureFire with CARB-compliant Tier 2 low emissions. Also, it starts quickly because of the Walbro carburetor with primer. Overall, this weed eater weighs 13.2 pounds. Part of that heft is due to the 59-inch solid steel shaft that comes with a lifetime warranty. Echo’s GT-225 had a glowing review from Popular Mechanics that highlighted two benefits. The first is that the 48-inch curved shaft balances the weight well. And the second is that the two-stroke 21.2cc engine starts quickly and has the power. We also noticed the two-line Rapid Loader head. But if you’re not a fan, try the EZ Feed attachment instead. And lefties beware: this trimmer has the throttle mounted for the right hand. If you’re tall, take a look at Hitachi’s CG23ECPSL weed whacker. It has a 69.6-inch length so that you can stop bending over to get the work done. The 22.5cc PureFire two-stroke engine keeps emissions down. Furthermore, users say it always starts by the second pull when it’s cold, or the first when it’s warm. Other vital features include an anti-vibration system and a solid steel drive shaft. You can also make it easier on yourself by purchasing premixed fuel/oil. Our other pick from Tanaka’s lineup weighs only 11.2 pounds. But it still has a solid steel drive shaft with vibration-reducing technology and padded handle. It’s powered by a commercial-grade 26.9cc two-cycle engine. The engine is CARB-compliant and has a Walbro carburetor with purge primer . You won’t need tools to change the attachment since it has a built-in spindle lock. And every part is built for durability. For example, even the fuel tank has a protective housing. Tanaka offers a two-year commercial or 7-year consumer warranty. Should you purchase it to loan as a rental, they offer one year’s coverage. Would you like to save a little money? Then try a refurbished model. Toro’s 25.4cc engine is commercial-grade for long life and quick starts. The string trimmer has a 60-inch straight shaft and a bump-feed head. Blue Max’s Extreme Duty trimmer and cutter is powered by a two-stroke 42.7cc Blue Max engine that runs on a 40:1 fuel to oil ratio. It weighs 17 pounds and has a straight shaft with anti-vibration handles. Users say that the three-prong brush cutter blade slices through 2-inch saplings with no problem even though the manufacturer states that the maximum is only one-inch thickness. Save yourself from an aching back and arms with this professional weed eater. It’s a field trimmer that you push similar to a lawnmower. You don’t have to balance and sweep a string trimmer to edge your driveway with this tool. Notice that it has a150cc engine that can tackle overgrown spots in a flash. The 22-inch cutting swath and 12-inch wheels help you cover a lot of rough ground quickly. The folding handle is coated with anti-vibration foam. Additionally, the trimmer comes with a two-year limited warranty and it’s both CARB and EPA-certified. Poulan Pro also makes a back-saving line trimmer that you walk behind. The 190cc Briggs & Stratton 675 EXI engine and 22-inch cutting width slices through rough terrain with weeds and brush. The 12-inch diameter wheels make sure you don’t get slowed down by ruts and rocks. Best of all, you can throttle down to tackle difficult spots. Remington’s walk-behind line trimmer makes a lot of customers happy. That’s because it’s trouble-free for non-professionals to use. It has a 22-inch cutting width and uses standard 0.155 trimmer line. You can adjust it to three different cutting heights to keep everything neatly manicured. And users appreciate that it doesn’t throw debris at them the same way a conventional weed eater does. It has a 159cc four-stroke OHV engine with plenty of power to slice weeds and tall grass. The off-set trimmer head makes it simple to reach awkward places. Finally, it’s covered by a two-year limited warranty. The only thing lacking in Swisher’s self-propelled string trimmer is a robot brain to operate it unattended. It has a 4.4 hp 160cc Honda engine that moves it forward at 2 mph. The 22-inch cutting width resembles a lawnmower’s work since it provides precision cuts with eight effective cutting lines. You can also adjust the height between 1.5 to 3.5 inches. Since the trimmer head is off-set, it allows you to reach into nooks and crannies. And you can turn the trimmer head on or off from the handlebar. This allows you to drive it without cutting anything. Yes, we know this is not a commercial-grade weed whacker. But there are pros who love to use it. That’s because Husqvarna’s 128LD string trimmer is compatible with attachments. This fact alone gives this one tool the ability to replace six others. 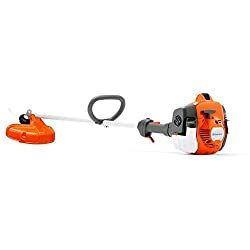 You can match it with Husqvarna’s (or Poulan Pro’s) brush cutter, pole saw, hedge trimmer, tree pruner, sweeper, and tiller accessories. It’s powered by a 28cc two-stroke engine and has a 17-inch cutting width. It uses 0.095 trimmer line and has a straight shaft. Husqvarna’s Smart Start technology ensures that one pool has it ready to go. Finally, it weighs only 10.8 pounds. Chances are, you’re an old pro at weed whacking. If not, try these tips to make the job go easier. To get rid of weeds growing in the cracks of the pavement, tilt your string trimmer so that the tip of the string is just brushing the pavement. Then move into the base of the weed to cut it flush. This takes a little practice as tilting too much or too little won’t get the job done right. Next, you can achieve a perfect edge between the grass and the sidewalk. Turn your trimmer till the string is vertical. Pass it along the edge. If you’ve never neatened up the grass in that spot before, you’ll probably dig up debris. But after you do this for a few weeks, you’ll train it to stay tidy. To wrap up, there’s one spot in your yard that you need to avoid. Never use a string trimmer right up against a tree. That’s because the string will cut into the bark and expose the tree to disease and pests. Instead, save yourself from future problems by laying down mulch around the base of the tree. Then you can edge around the mulch and never touch the tree. Which commercial line trimmer did you choose? We’d love to know which tool we helped you find. That’s because we’re always on the lookout for the best home and garden products.